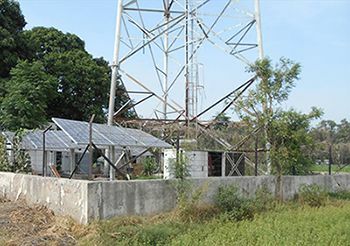 Tokyo, October 6, 2017 - NEC Corporation (NEC; TSE: 6701) completed of a demonstration project in India to introduce energy management technology utilizing renewable energy (solar power photovoltaic generation systems, "PV") and lithium-ion rechargeable battery systems (LiB) at telecom tower sites with unstable power supplies, aimed at reducing the fuel consumption of diesel generators. Mobile telecom operators in India often outsource ownership and operations to tower companies in order to secure and maintain facilities such as towers and power equipment. Due to cost reductions and conditions outlined in the Indian government's Green Telecom policy, tower companies are now being required to reduce fuel consumption by diesel generators, which are used as backup in the case of power failures. Moreover, the need to lower CO₂ emissions is also becoming an important issue for business managers, as well as a major social concern. In order to address these issues, the Japanese and Indian governments have collaborated in the creation of a demonstration project by Japan's New Energy and Industrial Technology Development Organization (NEDO), supported by the Ministry of Economy, Trade and Industry (METI). NEC was selected to implement this project through the introduction of advanced Energy Management Systems (EMS) beginning in 2014*. Since then, NEC has confirmed reductions in diesel fuel consumption, energy costs and CO₂ emissions, in addition to confirming the reliability of prediction technologies enhanced with artificial intelligence (AI) (estimating power failures, recovery times, etc. ), the safety of LiB and a reduction in Total Cost of Ownership (TCO). "NEC is focused on providing solutions for society that are friendly to people and the Earth," said Michihiro Ezawa, General Manager, ESS Division, NEC Corporation. "With approximately 400,000 telecom tower sites throughout India, there is a great deal of promise for these technologies to significantly reduce the impact on our environment, while improving business conditions. Moving forward, we aim to proceed rapidly with the verification of business models that enable effective commercialization of these technologies."